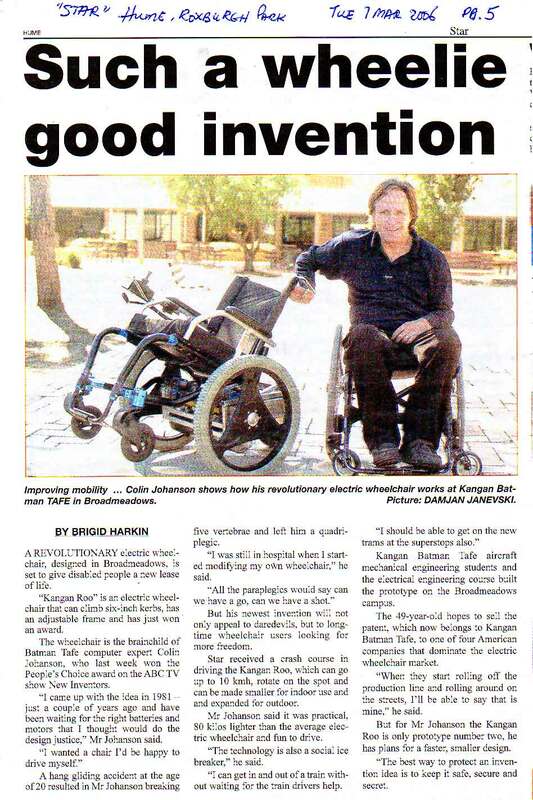 Like the Australian kangaroo, the Kangaroo® power chair has five points of contact with the ground. A kangaroo's power comes from its center, and a kangaroo uses its tail and front paws for control and balance. Similarly, the Kangaroo® uses a large rear caster to absorb the torque from the motors instead of transmitting it as 'wheelie" torque to the frame. This makes the Kangaroo ® much better at slope climbing than other chairs. The rear caster allows the front frame to "pop a mono" and rest comfortably and stably at approximately a 30º rearward tilt. The Kangaroo® can still be driven around flat areas in this "mono" mode and can be useful as a pressure relief mechanism, for blood pressure reduction, or to create a comfortable reclining chair for recreational purposes. The original prototypes were built with the assistance of Kangan Batman TAFE, and hence the old name. However, Cool Mobility Pty Ltd now have full rights to all the developed IP and the name "Kangaroo" registered as a Trademark in 2007. Hence all chairs will be known as the Kangaroo® in future. 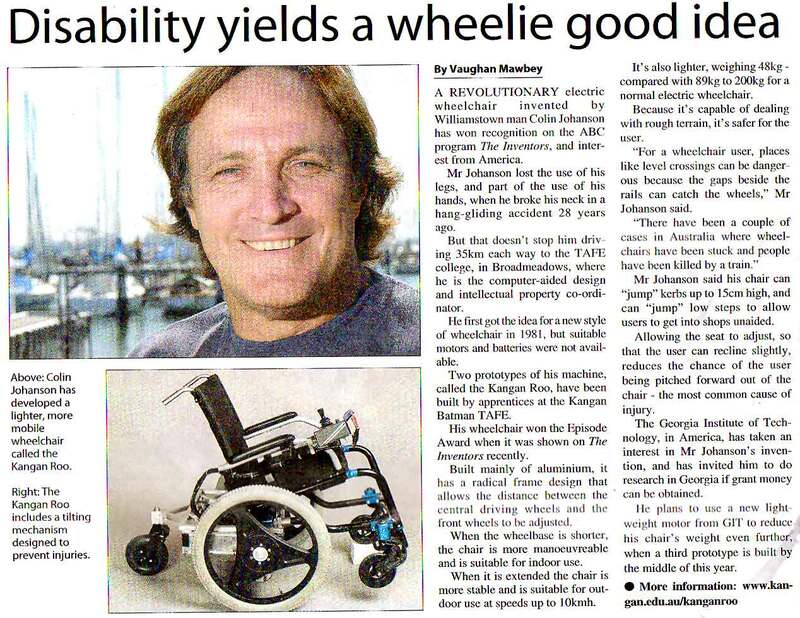 Initially the wheelchairs will hopefully be assembled in Australia. 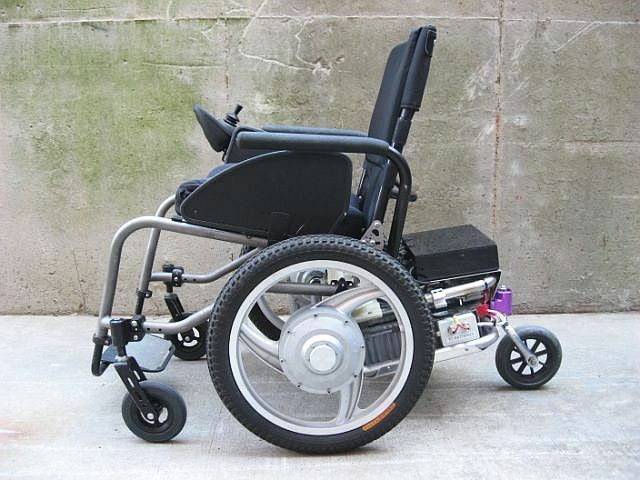 We aim to develop adapter kits for a range of chairs that suit - rigid frame, with no frame below axle tube so that you can just purchase our power module, if that suits you best. Sorry but we are still working on developing our new power system as the previous version was not powerful enough, with the old 24Volt determined by two "car batteries", proving it didn't have enough power capability (for those able to handle it), and had gears that were a weak point. We have been testing new gearless brushless hub motors (practically silent) from a number of potential suppliers to determine the best for our needs. Preliminary results are better than we expected. The new hub motors will have no gears to make noise or be inefficient, no brushes to wear down and need replacement, and the brakes should be practically silent too. Depending on manufacturer, we could theoretically reach speeds of above 30kph but we will be using motors with a maximum possible speed of 14kph (9mph), yet have more than enough starting torque. Maximum speed will, of course, be set at the legal speed limits for each country. We need to carry out much more testing for quality of manufacture and durability yet. We are designing a new 36V brushless motor controller here in Australia with full 4Q (four quadrature) control, as the only other commercial controller version available for our type of brushless motors was found to be unsatisfactory, as it didn't utilise the motor power well at low speeds. It also did not have the capacity to acurately control the speed of both motors, despite path surfaces or conditions, so that the chair tracks straight. It did however show the power of our motors, which will continuously spin the tires on smooth concrete 16" wheel with new nobby tires. That is impressive torque with my 85kg sitting in the chair and the fact that over 60% of weight is over those wheels. The new controller may develop even more power from the motors. The motors and controller are the most important parts (with new technology batteries - LiFePO4 - light and small) to making a very efficient, quiet and low maintenance system, so we are spending time to select and develop the best possible components. We want this chair to be a major leap forward in motor system design. Batteries have improved greatly with new technology and suppliers coming onto the market due to the demands of electric cars. We have our US Patent granted and the Australian and Chinese should be through soon too. Our India and EU Patents are still pending. We realise it is frustrating for all but we want to do it right first time. Any interested investors would be more than welcome to approach us directly. The third version of the design was built in mid 2006, largely at Kangan Batman TAFE, and as soon as it was finished was shipped to Atlanta, USA, where it was further worked upon with collaborators CATEA of Georgia Tech. 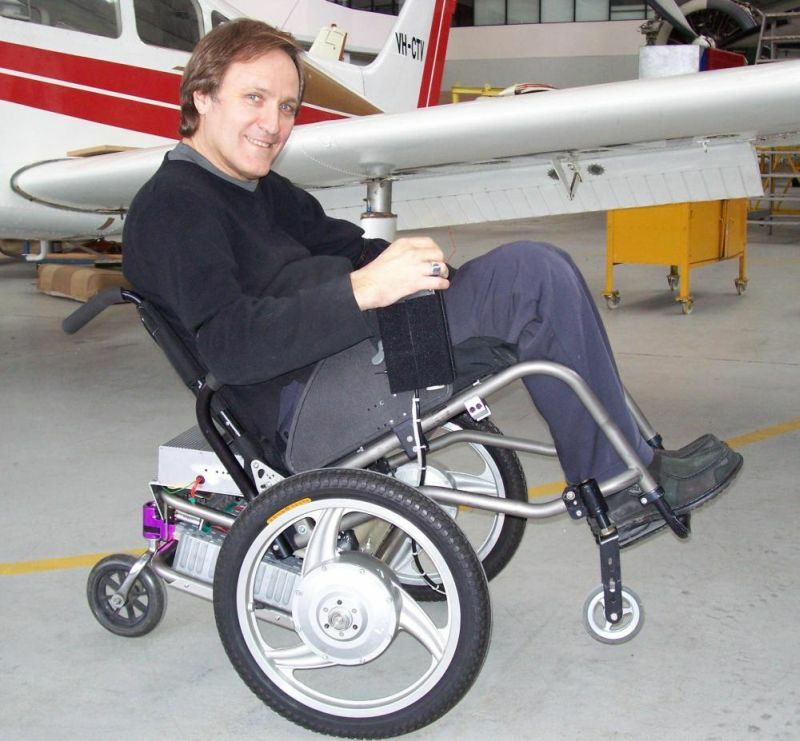 Colin worked on the wheelchair and a number of other projects during his month visit to work at CATEA. You can see more details, including video of this radical sports electric wheelchair on the Prototype 3 webpage. 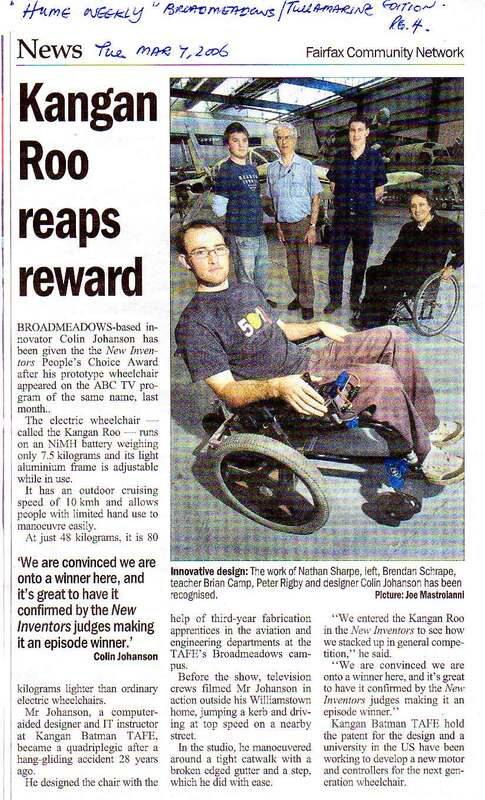 The second version of the Kangan Roo (now referred to as Kangaroo ®) design was built in mid 2005 and was entered into the Australian ABC TV program "The New Inventors" where in February 2006 the Kangan Roo (now referred to as Kangaroo ®) won the progam Judges Choice and Viewer's Choice. 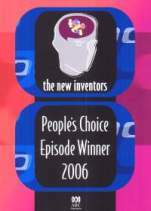 In the Final, it was announced to have won the overall "2006 Viewers Choice Award". As a result of this Colin was flown, thanks to the generosity of the Hong Kong Trade Development Council, to Hong Kong to have a stand at the "Ideas and Innovation Show" at the end of November 2006. During the three days, Colin met a number of potentially interested manufacturers who he is still in discussions with regarding commercialisation. 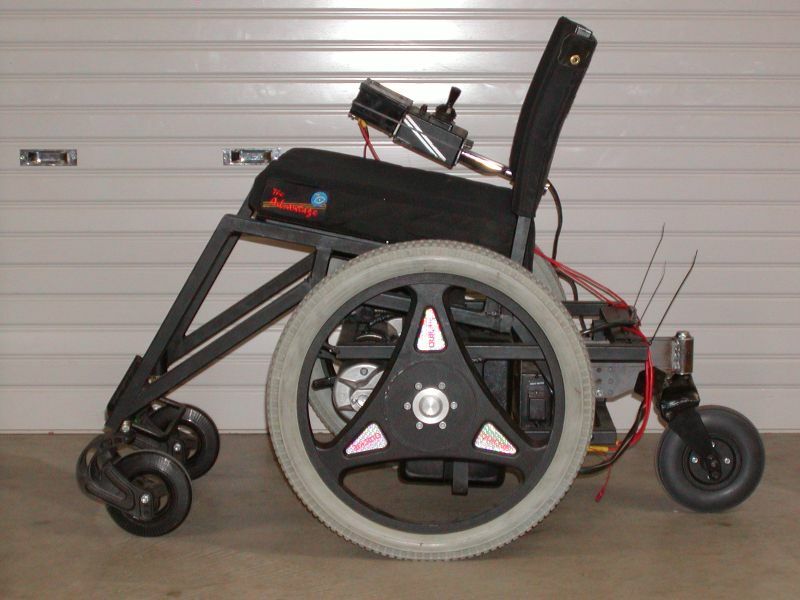 You can see more details, of this radical sports electric wheelchair on the Prototype 2 webpage. This was just a proof of concept to see if Colin's idea, that had been developing in his head since 1981, would actually work as envisioned. The first version of the design was built in 2005 and as soon as it was finished was tested on a variety of difficult terrain. Not only was it excellent at travelling over urban terrain, it was able to mount rolled gutters up to 6" high with ease. This version was built using motors and control unit from a Quickie P300 with large powerful four pole motors 20" wheels and two lead acid gell batteries of 18Ah each (which were still very heavy). 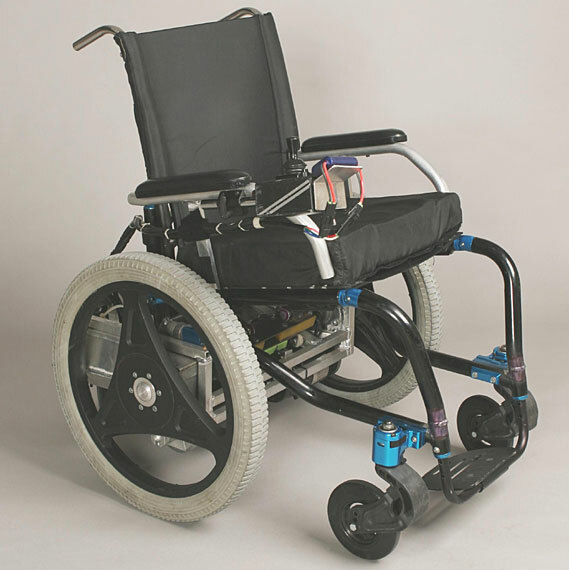 You can see more details of this radical sports electric wheelchair on the Prototype 1 webpage.